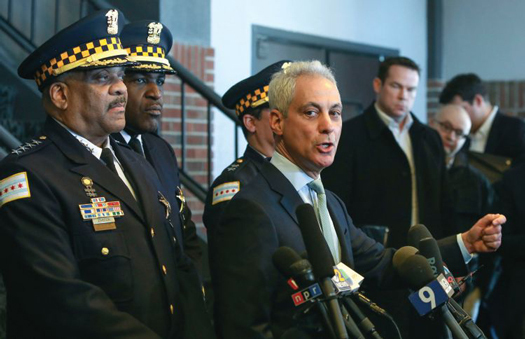 Chicago Mayor Rahm Emanuel, right, and Chicago Police Superintendent Eddie Johnson appear at a news conference in Chicago, March 26, after prosecutors abruptly dropped all charges against "Empire" actor Jussie Smollett, abandoning the case barely five weeks after he was accused of lying to police about being the target of a racist, anti-gay attack in downtown Chicago. The mayor and police chief blasted the decision and stood by the investigation that concluded Smollett staged a hoax. CHICAGO—Mayor Rahm Emanuel and Police Superintendent Eddie Johnson are being accused of hypocrisy after they lashed out at prosecutors, who abruptly dropped all 16 charges against Fox “Empire” actor Jussie Smollett. The move brought an end to a case that has played out in the national media for months. It has placed Cook County State’s Attorney Kim Foxx under fire and generated negative publicity for her mentor, mayoral candidate Toni Preckwinkle. She faces a tough runoff race to become Chicago’s first Black female mayor. But the fallout from the case is also generating support for Ms. Preckwinkle. Ms. Foxx angered the Fraternal Order of Police despite recusing herself from the case after a former aide to Michelle Obama emailed and texted her. The aide expressed concern that the police department was leaking details of the story to the press. Now, the FOP is requesting a federal investigation into Ms. Foxx’s role in a case where a Black man with a clean record was accused of a non-violent crime. Ms. Foxx said she played no role in the decision and that it was routine handling of what was a high profile case. Mr. Smollett performed 16 hours of community service at Rev. Jesse Jackson’s Rainbow Push headquarters and forfeited a $10,000 bond when charges were dropped March 23. He did not admit guilt and has maintained his innocence. An incensed mayor demanded that the Empire star pay $130,000 back to the city for charges occurred during the investigation and President Trump threatened to have the FBI look into the case but there didn’t appear to be any reason for federal authorities to get involved. But March 28, legal counsel for the city sent Mr. Smollett’s lawyer a letter asking for $130,160.15 in restitution. It charges “false statements” by the actor cost the city resources and hurt confidence in the criminal justice system. It demands payment in seven days and threatens Mr. Smollett with prosecution from the Department of Law, a fine of no less than $500 and a maximum of $1,000, “plus up to three times the amount of damages the city sustains as a result of the violation.” The city says it spent more than $150,000 on the case. 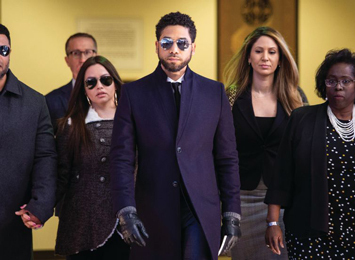 Actor Jussie Smollett, center, leaves the Leighton Criminal Courthouse in Chicago after prosecutors dropped all charges against him on March 26. Mr. Emanuel, who never came clean in the Laquan McDonald case, went on ABC’s “Good Morning America,” saying Mr. Smollett lied about the attack and criticized Ms. Foxx. He also questioned why Mr. Smollett’s court file was sealed and off limits to the public. “This is without a doubt, a whitewash of justice, and sends a clear message that if you’re in a position of influence and power, you’ll get treated one way, [while] other people will be treated another way. There’s no accountability in the system. It is wrong-full stop,” said the mayor in response to the announcement that there would be no prosecution. Ms. Foxx, in a media interview, stressed the disposition of the case was in line with standard procedures and said sealing the entire case was a mistake by the City Clerk’s Office. She also said going to trial doesn’t guarantee a conviction. Mayor Emanuel and Chief Johnson were not informed of the decision before Mr. Smollett walked out of the courthouse a free man amid a throng of supporters and journalists. While Mayor Emanuel lashed out at the decision, Supt. Johnson has stuck to his demands that Mr. Smollett apologize to the city after he was indicted for staging an attack with two Black men in Streeterville. Mr. Smollett initially drew support from colleagues and residents. That support weakened when police accused the actor of staging the attack in light of evidence. With little to no protests about the dropped charges against Mr. Smollett, Chicago’s Blacks accused the mayor and police chief of exaggerating the level of anger among city residents. In light of the city’s racial problems, Blacks remained insulted about how much passion both leaders have shown in bringing Mr. Smollett to justice as the city’s clearance rate in solving murders remained under 20 percent. Many went on WVON’s Perri Small radio show March 27 to express their anger at Mr. Emanuel and Supt. Johnson for their treatment of Mr. Smollett, and Ms. Foxx’s office. For Chicago’s Blacks, the mayor may have reopened old wounds that he caused after he suppressed a police video of the shooting of Laquan McDonald while he was re-elected to a second term with the overwhelming support of Black voters. During his term in office, Supt. Johnson’s police department has been riddled with cases of police misconduct that have put the city in an embarrassing national spotlight. Many Blacks were aghast after Supt. Johnson slammed Mr. Smollett on national television, claiming he damaged the reputation of the city with his actions. The city of Chicago paid out millions in settlements to make cases of police wrongdoing and misconduct to go away. And, according to a report last year, these settlements and borrowing to pay for them could eventually cost residents $1 billion. “Chicago is habitually relying on bond borrowing to fund its legal settlements and judgments, as well as other litigation costs,” according to Police Brutality Bonds: How Wall Street Profits from Our Abusive Policing System.